MICHU : PREMIER LEAGUE SUPERIOR TO LA LIGA! 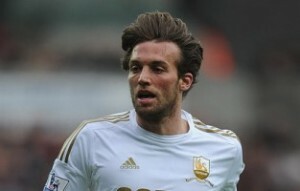 Swansea City midfielder Michu believes the Premier League is of higher standard than Spain’s La Liga. The Spaniard joined the Swans from Rayo Vallecano last summer, scoring 22 goals in his debut season in England, and suggests more players from Spain’s top flight will head over to England soon. The 27 year old said in The Sun : “The Premier League is superior in all aspects,”. “The structure, the fans, the competitiveness and, most of all, the economic power. “Any English club can now buy a Spanish player of any team except (Real) Madrid or Barca. “The Spanish market is very good value for money. He added: “The English league is much more competitive than it is in Spain. “Here you can win at any ground. In Spain it is impossible to go to the Nou Camp or the Bernabeu and expect to succeed. “The passion of fans in England is fantastic. Your supporters follow you to all your away games.